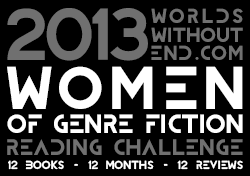 Normally, the last thing I need is encouragement to read more, but when I saw the 2013 Worlds Without End Women of Genre Fiction Reading Challenge, I had to join. The challenge: 12 books, 12 months, 12 reviews, all by women authors I’ve never read before. I love the idea, because there’s still an unconscious bias in our society to regard books written by men as being more worthy of merit, and the best way to combat it is through awareness of the bias and exposure to all the great fiction out there by women. I encourage everyone to join! Considering my prolific reading habits, 12 books is no challenge, nor that they’re written by women. (My statistics on this are actually pretty fascinating. A full 73% of the books I read last year were by women. However, only 55% of my “favorites” shelf on Goodreads are by women, so it’s possible I still have some of that bias. It’s also possible that my reading habits have changed, and my favorites haven’t caught up yet.) The “never read before” restriction may cause slightly more trouble, for the same reason, but that’s the point of the challenge–to discover new women authors. No matter how many I’ve read, I’m sure there are plenty left to choose from. No, I expect the challenge for me will be the reviews. I occasionally review books on Goodreads or Amazon, but they tend to be very short, just a quick description of what I loved about the book (or, very occasionally, disliked). I’ve never attempted to summarize the plot, or do any sort of deeper analysis. I want to be more complete with these 12 reviews, and it will be a new sort of writing for me. I’m considering posting my reviews here, though it’s a little outside my normal scope. Does anyone have strong feelings about it, one way or another? This entry was posted in Reading and tagged book, review, women by Emily Sandoval. Bookmark the permalink. Do it. I put my reviews up on my site. It’s a good way to spread the word about the Challenge, and about some of the awesome writers out there. Oh, by the way, nice to meet you. Just thought I’d drop in and voice my support!